Sagami Kabosu is a 5% fruit beer from Koganei Shuzo that uses locally sourced kabosu, a fruit that is similar to yuzu but has no direct English translation, from the Atusgi city area. This classifies Sagami Kabosu as a low-malt beer, otherwise known as the dreaded happo-shu style beer. Sagami Kabosu is available all year-round from Koganei Shuzo in bottles. Kabosu…yet to find out what that is in English. Not knowing what a kabosu was, I went in search of some but couldn’t find any at my local supermarkets. Even when I asked staff at both of them, all I got in return was the sharp intake of breath and a general look of bewilderment. It seems that kabosu are not a common fruit in Japan nor is it well known. Trying to find the English translation of the word meant Google Translate and Jisho.org just throwing the word back at me in Romaji. Great. So all I know about this fruit is that it’s in the yuzu family of fruits. Sagami Kabosu poured out a hazy golden colour with no head whatsoever. That thin rim of white stuff around the edge of the top of beer was just where it stuck to the side of the glass. Aroma wise, there was some hint of citrus-like tinge to it but really nothing that reminded me of the famed yuzu fruit. There was a meagre amount of sweetness from the malts but even that was a minute amount. Fruit beers are a difficult beer to like; done well, and the fruit accentuates the refreshing kick of a beer or pair well with the malts and hops found though if they are done badly, the fruit masks whatever flavour is supposed to be there, or has some weird chemical tinge to it that doesn’t feel right. Sagami Kabosu falls exactly in the last group for me. The supposed citrus taste just masks out whatever else is going in the beer and wasn’t refreshing nor pleasurable to drink. 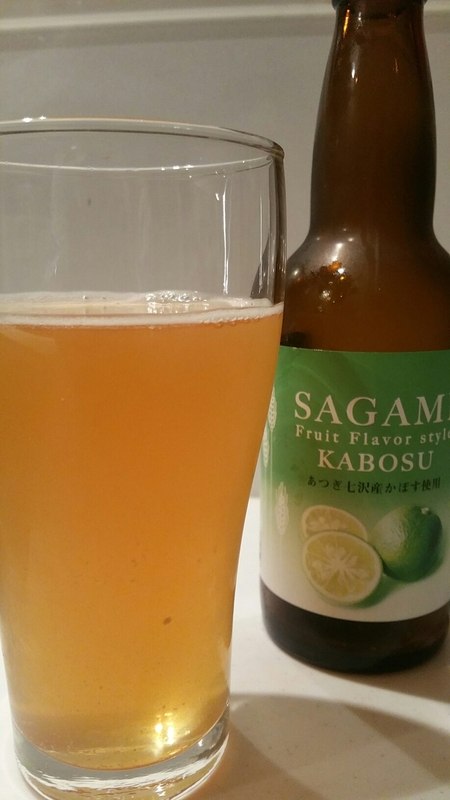 Sagami Kabosu isn’t a fruit beer I would buy again nor would I recommend. Surely there must be something from this list here.